If I told you this was the only lasagna recipe worth making, would you believe me? Well, let me give it a shot. This is thousand layer lasagna, first posted in 2006. Imagine dozens and dozens of whisper-thin sheets of fresh pasta brushed with the most vibrant red tomato sauce imaginable all intersecting layer after layer of warm, oozy, fresh mozzarella. Where the sauce and cheese and pasta touch the pan, particularly in the corners, everything gets crunchy and caramelized. I'll fight you for a corner piece. Seriously. This isn't a lasagna path for the faint-hearted. Making a dish of this magnitude takes commitment and patience - and time. Plenty of it. Although, not as much time as if you asked me about it last week. It dawned on me over the weekend, standing in front of the the fresh pasta vendor at the market, that I could shave a few hours off the production of it. That's right. Hours. This thing is a weekend project if there ever was one. The good news is that it makes a lot, and there's no chance you'll go hungry throughout the week. And it is so. good. I used to make this from scratch. Homemade pasta sheets, etc. This time I got a jump start by paying $3 for a pound of fresh egg pasta sheets at the farmers' market. Fantastic return on $3. 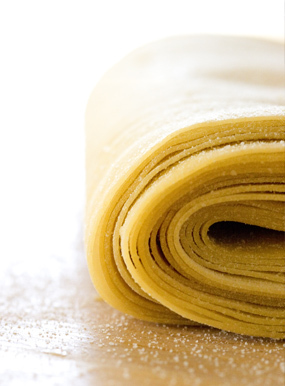 You still need to run those sheets through a pasta machine a few times to achieve the most thin and delicate sheets of pasta possible - but starting from pre-bought was a bit of a revelation for me, and a big timesaver. If you don't have a pasta machine (they are actually quite affordable! ), try a rolling pin - not quite the same, but will help thin out the sheets. It also dawned on me that I might be able to get away with skipping the pre-boil step in this recipe altogether and dial up the amount of sauce a bit (though I've never tried it this way). I suspect you might be sacrificing some of the tenderness of the noodles to save the time it takes to boil and drain, just a thought. Make sure the pasta sheets you buy are fresh and moist. Proper seasoning is important throughout this recipe, if you under salt it is going to taste flat and the flavors won't pop. The right amount of salt brings the pasta forward and focuses the tomato and lemon flavors in the sauce. Preheat your oven to 375. Start by clearing off every flat space in your kitchen, you are going to need and use all of it. Fill your biggest pot full of water and bring to a boil. Lavishly butter a deep, square baking dish. The one I use is 9x9 and 2 1/2-inches deep. Place the olive oil, salt, pepper flakes, and garlic in a pan. Dial the heat up and saute for a minute or two. Add the tomatoes and slowly bring to a simmer as well. Remove from heat, stir in the lemon zest and taste for seasoning. Add more salt if needed. Set aside. Thin out your pasta using a pasta machine. Start by cutting the big sheets into 2-inch(ish) wide ribbons. This means making 2 cuts along the sheets. This should yield you about 12 2-foot strips. Run them through the pasta machine. I go to the 8 setting, one shy of the very thinnest setting. The sheets should almost be translucent. Cut the strips into manageable rectangles roughly 4-inches in length. To pre-cook the pasta, fill a large bowl with cold water and a few glugs of olive oil. Place a large flour sack or cotton dish towel across one of your counters. Salt your pot of boiling water generously. Ok, now you are ready to boil off your pasta. Believe it or not, you are on the home stretch. Place a handful of the pasta rectangles into the boiling water to cook (I've found I can get away with about 20 at a time), fish them out (I use a pasta claw) after just 15-20 seconds, don't over cook. Transfer them immediately to the cold olive-oil water for a quick swim and cool-off. Remove from the cold water bath and place flat and neat on the cotton towel. It is ok for them to overlap, I don't have a problem with the sheets sticking typically. Repeat until all your pasta is boiled. Ladle a bit of the sauce into the bottom of the prepared baking dish. Cover the bottom with a layer of pasta sheets. Now a thin layer of sauce, and a bit of cheese. Go for another layer of pasta, then sauce, then pasta again, then sauce and cheese. Keep going until you've used up all the sauce and pasta. You want to finish with a layer of pasta. Top with the last of the sauce and the very last of the cheese so you have a nice cheesy top. Bake until everything is melted and fragrant, 35 minutes or so. Let it sit for 10 minutes before serving, so everything has a chance to set up a bit. Dust with parmesan and a bit of slivered basil.